Wednesday, May 1, 2013, 6:00 p.m. 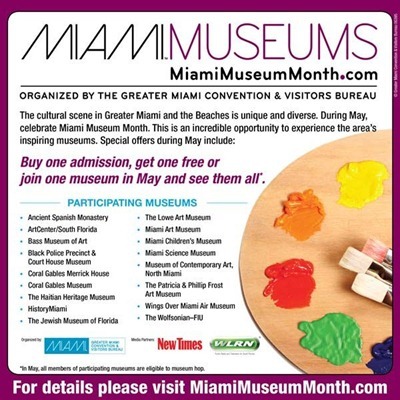 Please join the Greater Miami Convention & Visitors Bureau as we release our second edition of the Miami Heritage Guide and we launch Miami Museum Month 2013. The event takes place May 1, 2013 at 6 p.m. at the Coral Gables Museum (285 Aragon Avenue). Come network and enjoy cocktails and hors d’oeuvres in this beautiful historic space! Space is limited so please RSVP today.